Players will need to focus on technique with any first touch drills for soccer. Young players try to do everything fast and the technique suffers. Teaching them to slow down and learn first is the best way in getting the technique correct. This first touch soccer drill will work the first touch on the soccer ball and running with/out the soccer ball. Players will also improve coordination, conditioning and response time. Split up players in groups of 2 with one soccer ball. Set the grid up by marking one passing channel 1 m/yd wide. Set up another passing channel of the same size 15 – 20 m/yd away, in a straight line. Finish with putting one cone in the middle of the two passing channels. Two players will start passing the soccer ball through the passing channel, using one touch pass to each other. Players will jog towards the ball, make a pass, and back pedal. Always staying on their toes and using the correct technique to pass the soccer ball (body over the ball, toes up and ankle locked). 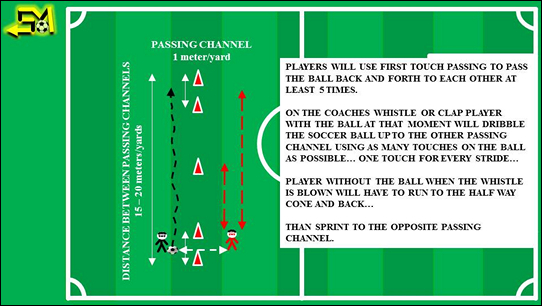 On 5th, or 10th pass, one of the players will start dribbling the soccer ball with as many touches as possible towards the other passing channel. Player without the ball will sprint to the middle cone, than back to the starting cone, and then to the opposite passing channel. At the opposite channel, same player runs with the ball, and same player without the ball. Players switch roles after 2 or 4 runs with/out the ball. ALWAYS PRACTICE DOING ANY DRILL WITH BOTH FEET, Left and Right.